When I visit Borneo, every chance I get, I go on night walks and night safaris in hopes to see one of these amazing creatures. On our last trip to Borneo, one of our favorite rangers - Gabili, took us on a 2.5 hour night walk. Right as we were coming to the end of our trek we found this little guy. It was even more amazing to see one in real life than I could have imagined. He just sort of sat their and let us snap a few shots. Once he decided we had enough he just hopped off from one tree trunk to the next and was gone in an instant. My sister took the amazing photo above, which will be available in our store in a few days. Classification: Tarsius bancanus (scientific name) is a species of prosimian, a primate that is not a monkey or ape. 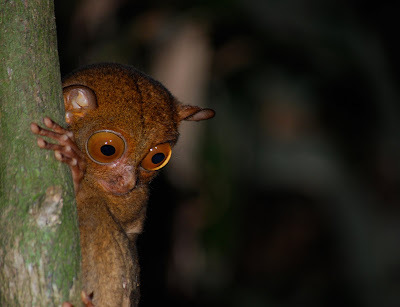 Also known as Horsfield's Tarsier. Range: Southern Sumatra, Borneo and surrounding islands. Habitat: Primarily found in secondary forest in dense ground vegetation and small trees. Can also be found in primary forest and plantations. Threats: The tarsiers' main threat is habitat loss due to converting forest to palm oil plantations, fires and logging. It is also a victim of illegal pet trade and suffers contamination from pesticides. -The Tarsier can almost always be found between 3.5 - 6 m above the forest floor. -Their eyes are extremely large in proportion to their body size. Each eyeball is as large as their entire brain. 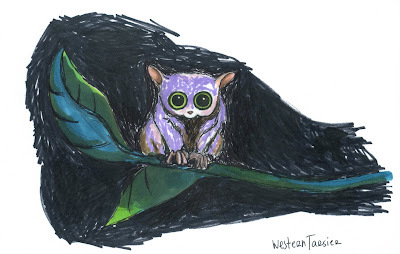 -Unlike most nocturnal animals, Tarsiers lack the light reflecting part of the eye - making them very difficult to find. -Fossels of Tarsiers have been found in Europe, Asia and North America.